The sport has been symbol of Tamil tradition for a long time!! Has anyone linked to ban of Jallikattu seen how these Bulls are taken care of??? Not sure where these so called animal lovers are when these animals are killed and served as beef?? These animals are openly smuggled to Kerela and being killed!! There are lacks of deserted cow’s that eat garbage!!! How many are rescued and rehabilitated?? Also the judiciary which has no connect with emotions of people has passed a judgement which is only going to take people’s trust on Judiciary & Judges further down!!! Finally we are not going to bow down easily!!! We will take every means to continue with our tradition and pride!!! Even I support Jallikattu, Infact People who support this, people owning the bull or cow, need to form an NGO to Protect Tamil sentiments. These are my thoughts.. There is so much wrong conceptions created about this Traditional festival sport. And we see an NGO funded outside India is able to influence Law in our country and are able to humiliate the Human values and festival celebrations done by Tamilians in India. If they are against cruelty towards animals, how many of these Organization people support other Multinationals providing pork and beef in their Pizza? They say People for Ethical Animal Treatment but Seems they don’t have any Ethical belief of Traditions / Festival values and more than all Emotions of Tamilian Culture. Tamil is one of the oldest of all Cultures across the World. Do agree, we need strict regulations to conduct the Sport but not a complete Ban. This is an organization sourced out of India and let this be banned, if they don’t value Indian / Tamilian Tradition and values. If they can spend so much money to get this court verdict, this organizations Taxing and source funding needs to be scrutinized and Probably impose a BAN to these kind of organizations and their activity of playing with Indian values. And let them work for stray animals, let them not talk about Pet Bulls being grown by Tamilians. If they want to help, let them help injured Bulls or humans in the sport as first aid crew. They should not rule Tamilian sentiments. In no way these outsourced NGOs should be supported from India, if they are not understanding our Tamilian tradition and cultures. And our legal system is so weak, that it has yielded to such outsourced NGO’s plea. India is peaceful and sovereign country, we worship COW and Bull unlike the people from US, who eat pork and Beef. It is a shame to secular state of India, as the sentiments of Tamil people has been neglected and wrongly conceptualized. If Tamilians are so cruel, they will not put the Bull statue in all Shiva Temples and will make it as a part of their prayers, when they visit the Temples. Again, regarding the accidents and damage to bull or human life during this festival sport isn’t any different from any other sport. How many car crashes or Bikes crash during the Formula one races? It is a tough sport and accidents will happen. And I see some blogs comparing this sport with the Bull fight and other things. This is not a Bull fight. The Animal is not going to be killed after the sport. Tamil Language is one of the ancient Language and We are the People who have given the great Saint poet- Thivalluvar to this world. When this Tamil culture can teach the world about Humanity and proper survival, why will the tradition of the Tamil Society be compromised for an NGO sourced out of India. If we are Indians, we need to Value our Tradition and culture. In ancient Days, when a Girl is Born, the Father of the Girl will get a Bull (calf) and will grow it as his Son. Once the Girl grows up and becomes ready for marriage, the Person, who can win the Bull can only marry the Girl. This was a Test of valor for the Bride groom. This was the method used to select the best Groom for the Girl. This is old tradition though. But This cannot be commented by people like ViratKholi, Nagma etc. who don’t have any knowledge of Tamil culture .They cannot compare this sport with old system of Sati. And Tamil culture never encouraged any savage act like Sati. There charges are baseless and let them first learn the Tamil culture and values before offering statements to Press and Media. First they need to understand Tamil culture better. Let them do their job of celebrity and have no right to talk about Tamilians. Even I support this. In-fact all people who support need to counter this outsourced NGO from running our traditional practice. We need to protect our traditions. Hi, Even I support this Jallikattu. Infact, all the Tamil people who support this need to form an NGO in support of the this Bull festivals and infact band the outsourced NGO, which dont value Tamilian sentiments. Would you create Facebook Profile Overlay to show the support for Jallikattu? 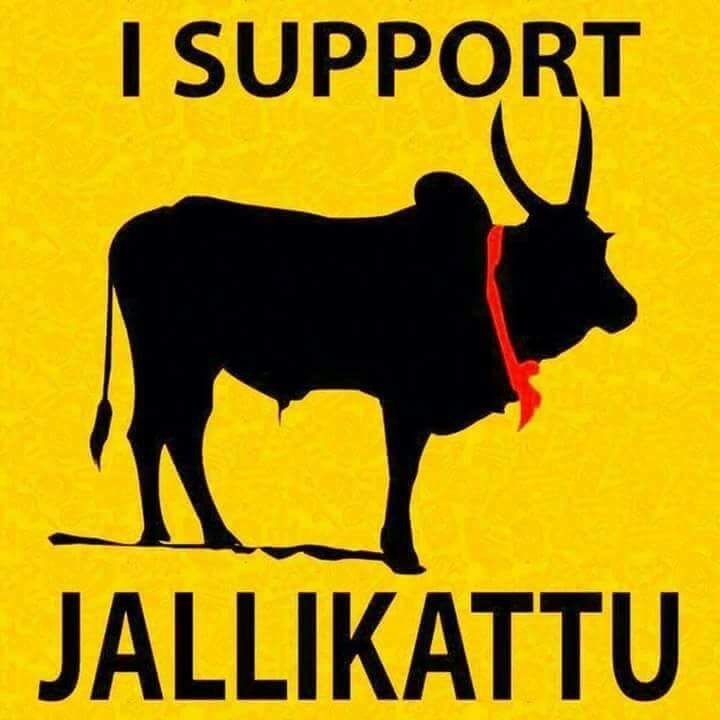 With the Facebook Profile Overlay, we can include your “I Support Jallikattu” in our DP.